The CBD Tarot de Marseille is a reproduction of the Conver Marseilles from 1760. Rather than create an exact replica of the original, Ben-Dov has adapted Conver's images to modern printing and artistic sensibilities. The line textures, the face expressions and the colors are adapted to the new printing techniques and visual sensibilities without changing the basic details of the cards. The CBD deck was printed in Belgium by Carta Mundi. The cards have a white background, with a thin black border around the image. In the majors, the card number appears in Roman numerals at the top of the card while the card title in French runs across the bottom. Justice is 8, Strength is 11. The titles of the minor suits and the court cards are also the traditional French. The back of the cards is a blue symmetrical repetitive pattern, designed after a Andalusian tile. 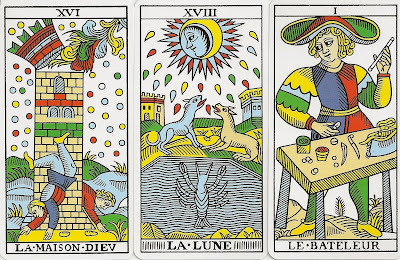 The deck comes with a leaflet in English with suggested interpretations for the cards.